Cairo and the ancient monuments of the Egyptian empire have fascinated visitors throughout the centuries. The mystifying Sphinx and the pyramids of Giza, over four thousand years old, stand majestically on the outskirts of the city at the edge of the desert. Cairo's Museum of Antiquities holds one of the finest collections of artifacts in the world, including the astounding treasures of King Tutankhamen's tomb. Aside from visiting the pyramids near Cairo, Luxor and Al Karnak are places not to be missed when in search of ancient Egyptian monuments and artifacts. Luxor is on the southern part of ancient Thebes, Al Karnak on the north. Between the two, visitors can lose themselves for days in the hundreds of temples, chapels, tombs and gardens in the area. Too extensive to list all of them, a few of the tombs not to be missed are the tombs of Nefertari, Amenhotep II & III, several Ramesses and Tutankhamen. The city of Dendera is located 60km north of Luxor and is on the west bank of the Nile. The well preserved Temple of Hathor is the main attraction of the city. The Valley of the Kings in Upper Egypt contains many of the tombs of pharaohs from the New Kingdom, including Tutankhamun and Ramesses the Great. In Kom Ombo tourists can visit the roofless Temple of Kom Ombo which was built for the falcon and crocodile gods. The Temple of Sobek is another attraction in Kom Ombo where a mummified crocodile can be seen! Aswan is Egypt's sunniest southern city and has a distinctively African atmosphere. The pace of life here in the most beautiful setting on the Nile is slow and relaxing. It is a favorite winter resort spot for Europeans, Middle Easterns and Africans alike - it's a perfect place to get away from it all. Strolling up and down the Corniche, one can watch sailboats glide by. Savor the flavor of locally caught fish while listening to Nubian music or wander in the bazaar and get lost in the sights and sounds of this mystical place. Visit the Aga Khan Mausoleum, the Monastery at Qubbat al-Hawa, the Unfinished Obelisk, The Tombs of the Nobles, Qubbat al-Hawa, the Monastery at Aswan , or the St. Simeon monastery (Anba Hatre), uninhabited and just outside of Aswan. Edfu(Idfu) was the Greek city of Apollinopolis Magna located about 33 miles south of Isna and 65 miles north of Aswan. The city is a religious and commercial center that produces sugar and pottery. The Temple of Horus, a preserved cult temple, is located in Edfu. 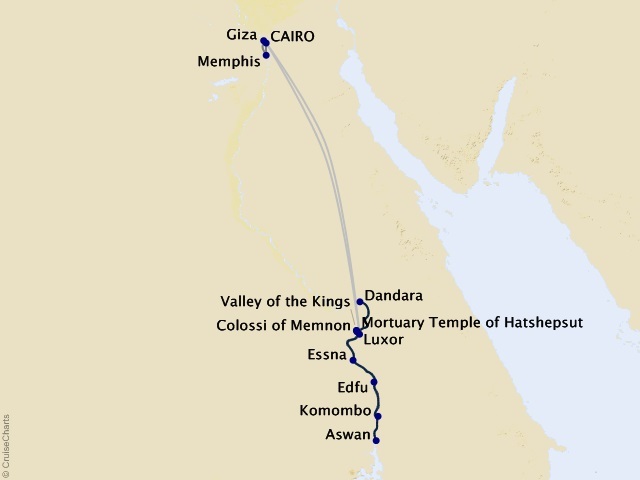 Isna is located about 33 miles south of Luxor. The town's Greek name was Latopolis and here fish (lates) where thought to embody the goddess Neith, who was sacred to the area. Isna was increasingly important during the 18th dynasty due to Egypt's developing relationship with the Sudan. There was a route established between Isna and Derr. Later, the city slowly declined until it received renewed interest during the 26th Dynasty. Later, under the Greeks and Romans, it became the capital of the Third Nome of Upper Egypt. Memphis is known as the home of Elvis Presley and as birth place of the blues. Don't forget to travel down Beale Street and listen to some of the worlds best blues bands. Hike, bike, golf, go for a balloon ride and take tours through the history of Elvis Presley's life. Don't forget some great sites in Memphis such as: Alex Haley's Home, Beale Street, and the W.C. Handy Home. Take a trip to the Memphis Zoo or jump on exiting amusement park rides at Libertyland Amusement Park. Giza is located only a few kilometers south of Cairo, several hundred meters from the last houses in the southernmost part of the city proper, where a limestone cliff rises abruptly from the other side of a sandy desert plateau. The ancient Egyptians called this place imentet, "The West" or kher neter, "the necropolis". Though the three Great Pyramids are the most famous and prominent monuments at Giza, the site has actually been a Necropolis almost since the beginning of Pharaonic Egypt. 7-night cruise in a riverview stateroom on the lovely River Tosca. 4-nights in Cairo at the splendid Four Seasons Cairo at Nile Plaza (or similar). Payment in full for optional airfare booked in conjunction with a Uniworld Cruise or Cruise-Tour is required at time of booking. Upon receipt of full air payment, your airfare, taxes and fuel surcharges are final. You may cancel your air within 24 hours of booking and receive a full refund of the cost of the airfare.